The Boone Central/Newman Grove volleyball team saw its 2013 season come to an end Monday night at Neligh, dropping a 3-0 decision to Mid-State Conference rival Norfolk Catholic in the C1-8 Sub-District Tournament. 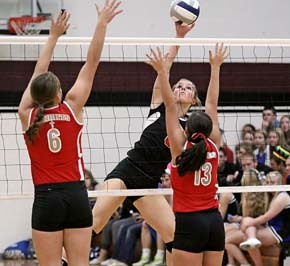 The Cardinals and Lady Knights battled back and forth throughout three close sets, rarely able to open large leads. Catholic did capture the crucial points in the stretch of each set, however, to take the 25-22, 25-17, 25-21 victory. It was a frustrating night for Boone Central/Newman Grove, which had finished its regular season with a victory, then placed sixth in the rugged Mid-State Conference tournament last week with competitive play. While the Cardinals never found consistent rhythm Monday night, Coach Susan Roberts said it wasn’t for lack of effort.